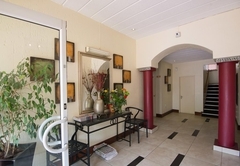 Premiere Classe Suite Hotel is a 3 star graded hotel offering Melrose North accommodation for tourists and visitors of Johannesburg. Premiere Classe Suite Hotel offers you the ultimate in affordable accommodation in one or two bedroom fully furnished, self catering apartments. Breakfast available on request. 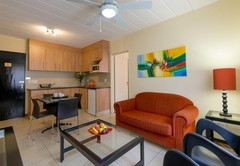 Premiere Classe Suite Hotel provides clean comfortable accommodation in modern, executive furnished apartments for your short or longer term accommodation requirements. 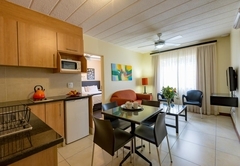 There are 18 one bedroom and 10 two bedroom, fully fitted and furnished apartments which are serviced daily. We provide complimentary uncapped fibre optic wifi as well as a generator for load shedding. Linen is supplied and towels are changed daily. 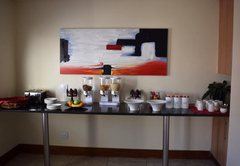 An English or Continental breakfast can be arranged which will be served in your apartment at the requested time. The establishment is owner run with the assistance of honest and reliable staff. We have a security guard from 6pm to 7am and secure covered parking. Premiere Classe offers you a reception, open between 7am and 9pm, a facsimile, message and laundry service. We also offer a grocery service as well as organising a taxi service. 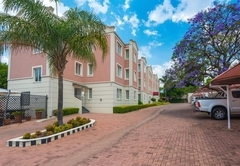 Premiere Classe Suite Hotel is situated between Rosebank and Sandton City in Melrose, 500 metres to M1 motorway, Corlett Drive onramp, leading to the City Centre and Pretoria. 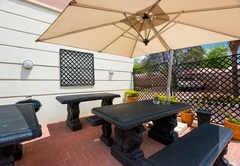 250 metres to the Wanderers Cricket Grounds and golf course, walking distance to Melrose Arch which has a number of good restaurants and the newest Virgin Active gym. 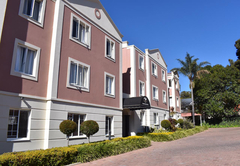 In close proximity to Morningside Clinic, Rosebank Mall and Sandton City. Premiere Classe offers ample reason for it to be your choice when staying in Johannesburg. 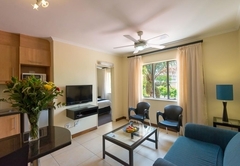 1 Bedroom Apartment with en-suite shower - One bedroom, queen or two single beds apartment with en-suite bathroom (shower only) and queen size bed. 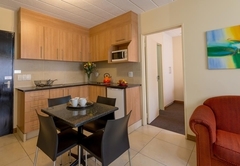 Fully furnished, kitchenette with fridge/freezer, self-catering. Serviced daily. 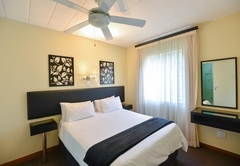 TV with M-Net and 9 DSTV channels, free wireless internet. 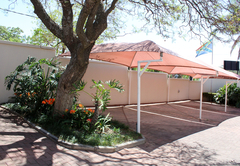 2 Bedroom Apartment, 2 en-suite bathroom - 2 bedroom apartment, each with queen or double or 4 single beds. 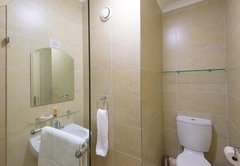 2 en-suite bathrooms, 1 with bath & separate shower, 1 with shower only. DSTV. Fully furnished, self-catering. Rooms cleaned every day. 24 hour security. Wireless internet. 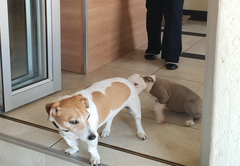 The hotel staff was most friendly, extremely competent and made our stay away from home as comforting and pleasing as possible. Two of us stayed in the cozy, secured apartment: one who was returning to Premiere Classe after 14 years and me, who had never been to South Africa prior. Arriving during the South African winter season was something we were dreading because the heating systems in America are known to be far more advanced in keeping us warm and toasty as compared to the lack of heating resources available in S. Africa. 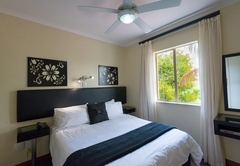 As a reassuring gesture, the on-site guest manager, Belinda, and owner, Merle, had wall heaters installed in each room of the apartment along with electric blankets placed on the beds. This made our stay quite warm and comfortable. We did have the misfortune of a malfunctioning oven and when we mentioned it, the stove was replaced the next morning. As a courtesy, Belinda was kind enough to heat our food in her own oven and had it brought back upstairs to us when it was ready. 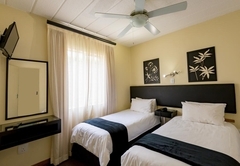 The rooms were cleaned daily with the assistance of housekeepers Peggy and Elizabeth. Their service was fantastic - no complaints from us whatsoever. Messages and packages were securely left for us and were available on our return back from our daily excursions. Premiere Classe provided us with exemplary local resources for tours and transportation during our three week stay. 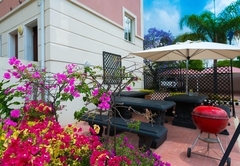 The front desk staff was tremendous with remarkable exemplary guest services provided by Tumi and others. Towards the end of our stay, they were busy with renovations: enlarging rooms, changing out fixtures and erecting a dining area for guests. 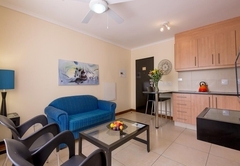 Good value apartments for short or long stays in Johannesburg... efficiently run, centrally located and very friendly, helpful staff. Response timePremiere Classe Suite Hotel typically responds to requests in 5-10 minutes.